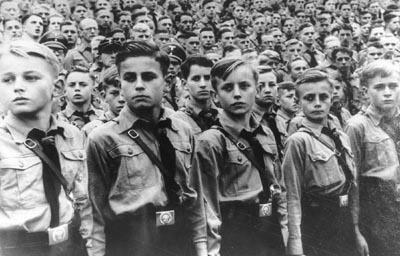 Holocaust Survivors: Photo Gallery - "Hitler Youth"
Grim beyond their years, boys belonging to the Hitlerjugend (Hitler Youth) turn eyes at a Nazi rally. Their belt buckles carry the stern motto: "Blood and Honor". The Hitlerjugend admitted children at the age of 10, and continued until the age of 18. It was organized on a military pattern and prepared a young man to become a soldier or an SS. The young men were indoctrinated with the Nazi ideology. Photo Credit: Bayerische Staatsbibliothek, courtesy USHMM.